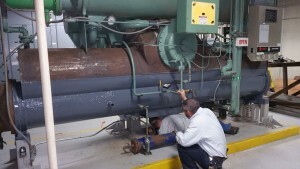 Case History: Irvine Company – Chiller Repair – Enetech Inc.
Case Background: The Irvine Company had undertaken the upgrade of the climate control system for one of its major office buildings in Newport Beach. 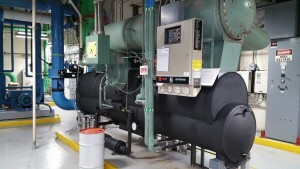 Included in this project was the complete rebuild of the main chiller unit. 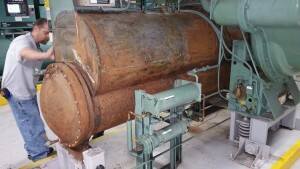 The location of the chiller unit presented some major access problems for both surface preparation and coating applications. Ultimately, the unit was cleaned to bare metal followed by a two-part 100% solids high performance polymer component (Enecon Speedalloy) followed by a top coat also composed 100% solids high performance polymer component (Enecon Chemclad SC).